Introduction: Throughout the history of medicine, physicians have sought less invasive approaches to the diagnosis and therapy of diseases. Since the advent of interventional endoscopic therapy, the fields of gastrointestinal surgery and interventional endoscopy have been on converging paths. Therapeutic endoscopists are becoming increasingly invasive, performing interventions such as transgastric pseudocyst drainage and pancreatic necrosectomy. In contrast, surgical interventions in the peritoneal cavity have become less invasive, particularly with the advent of laparoscopic surgery, culminating in the formation of minimally invasive surgical centers of excellence. Therefore, from the standpoint of invasiveness, it appears that NOTES may be the natural convergence of laparoscopic surgery and therapeutic endoscopy. Another important but overlooked development in the genesis of NOTES is the collaboration between surgeons and gastroenterologists, an equal partnership between 2 specialties that manage the same disease conditions. 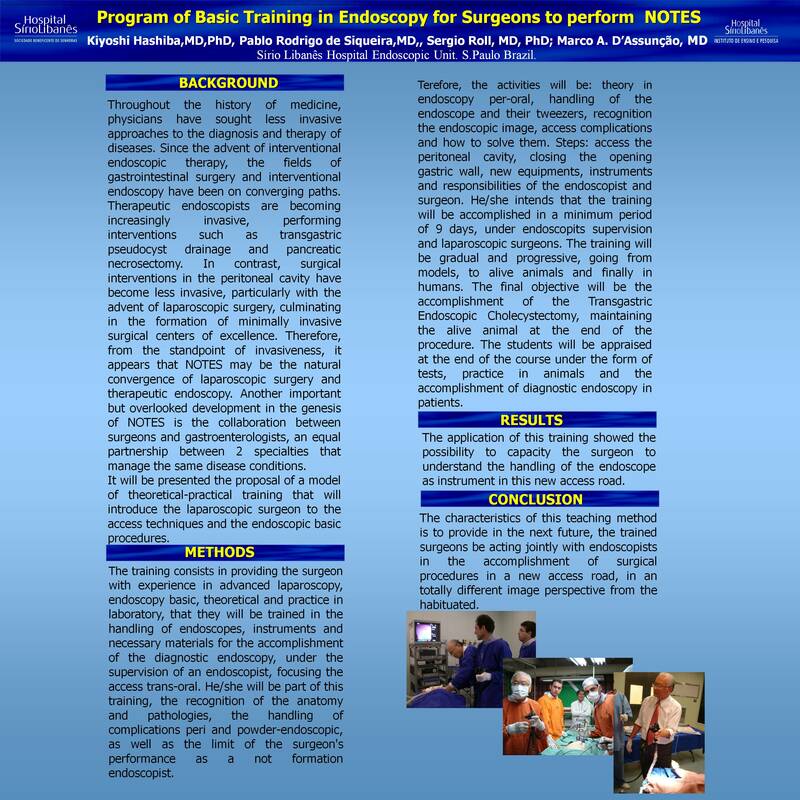 It will be presented the proposal of a model of theoretical-practical training that will introduce the laparoscopic surgeon to the access techniques and the endoscopic basic procedures. Material and method: The training consists in providing the surgeon with experience in advanced laparoscopy, endoscopy basic, theoretical and practice in laboratory, that they will be trained in the handling of endoscopes, instruments and necessary materials for the accomplishment of the diagnostic endoscopy, under the supervision of an endoscopist, focusing the access trans-oral. He/she will be part of this training, the recognition of the anatomy and pathologies, the handling of complications peri and powder-endoscopic, as well as the limit of the surgeon’s performance as a not formation endoscopist. Therefore, the activities will be: theory in endoscopy per-oral, handling of the endoscope and their tweezers, recognition the endoscopic image, access complications and how to solve them. Steps: access the peritoneal cavity, closing the opening gastric wall, new equipments, instruments and responsibilities of the endoscopist and surgeon. He/she intends that the training will be accomplished in a minimum period of 9 days, under endoscopits supervision and laparoscopic surgeons. The training will be gradual and progressive, going from models, to alive animals and finally in humans. The final objective will be the accomplishment of the Transgastric Endoscopic Cholecystectomy, maintaining the alive animal at the end of the procedure. The students will be appraised at the end of the course under the form of tests, practice in animals and the accomplishment of diagnostic endoscopy in patients. Results: The application of this training showed the possibility to capacity the surgeon to understand the handling of the endoscope as instrument in this new access road. Conclusion: The characteristics of this teaching method is to provide in the next future, the trained surgeons be acting jointly with endoscopists in the accomplishment of surgical procedures in a new access road, in an totally different image perspective from the habituated.